Product prices and availability are accurate as of 2019-04-18 04:19:06 EDT and are subject to change. Any price and availability information displayed on http://www.amazon.com/ at the time of purchase will apply to the purchase of this product. Boost productivity with this fast HP Officejet 6500 All-in-One Printer, networked all-in-one saves up to 40% per color page over lasers. Maximum print speeds of 32 ppm black, 31 ppm color. Speeds equivalent to a laser printer with up to 7 ppm black, 7 ppm color. Easily share this all-in-one and efficiently use resources with embedded wired Ethernet networking. Easy-to-use workflow tools let you scan to PC or memory cards plus digital fax options. Up to 40 percent lower cost per color page vs. lasers. Print color for up to 40% less cost per page than competitive lasers using HP Officejet inks. Save money by replacing only the individual ink cartridge that runs out. Get more pages and fewer cartridge replacements with available high capacity cartridges. Get professional quality black text, and vivid color graphics and photos with HP Officejet ink. Save money and energy with this efficient ENERGY STAR qualified all in one. Cut energy use by as much as 40% when using this HP All-in-One instead of four separate products. 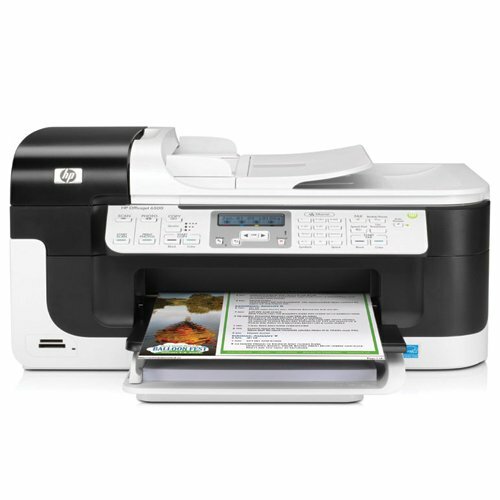 This HP Officejet All-in-One consumes up to 40% less energy than color laser all-in-ones. Enjoy free, easy recycling cartridges returned via HP Planet Partners are recycled responsibly.